Open, clean, and modern with classy touches of Smoky Mountain décor—this is one way to describe Paradise Peak, a large group cabin only 5 miles from downtown Pigeon Forge. 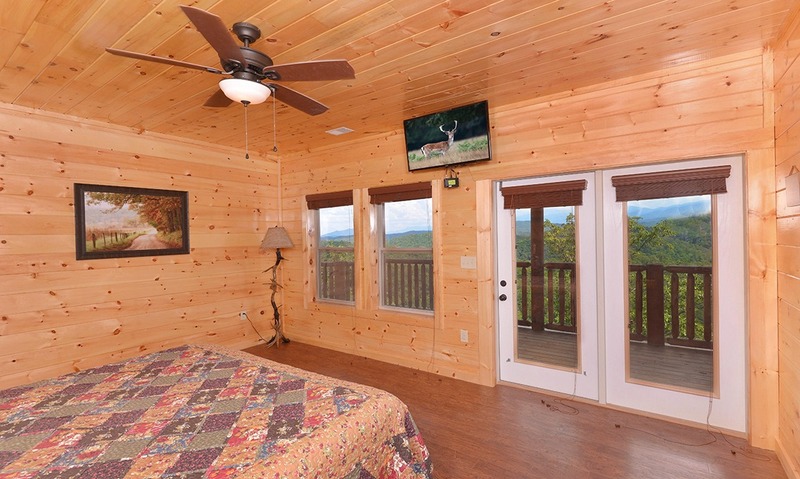 Another way is to mention this cabin’s impressive Smoky Mountain views. In fact, Paradise Peak offers some of the best views of Mount LeConte you’ll find in East Tennessee, and you can see them in any season because of this cabin’s position high above the trees. With 5 bedrooms, 5 ½ bathrooms, and over 4,000 square feet of space, Paradise Peak – built new in 2016 – is truly a spacious Pigeon Forge paradise waiting to be enjoyed by your large group. 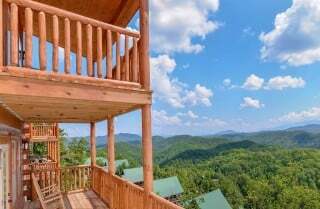 Whether you’re housing a wedding party, planning a getaway with friends, hosting a family reunion, or sponsoring a company retreat, this 20-person cabin is sure to impress with its elegant appeal and wide variety of entertaining options. 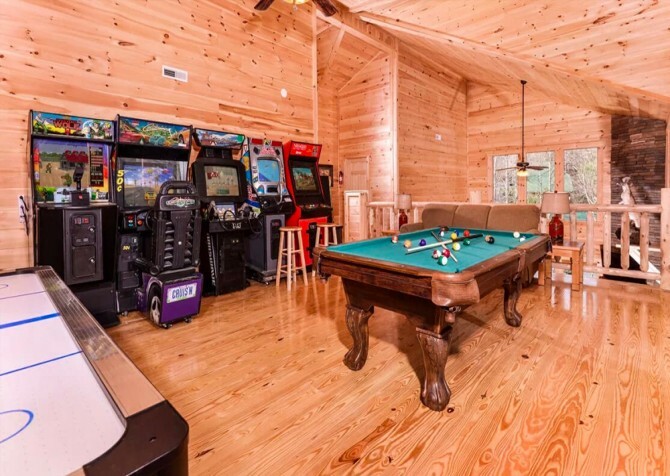 Some of those options include a movie theater with a 100-inch projection movie screen, a game room with a pool table, community pool access, and even a heated private indoor pool with a waterfall! Enjoy all this and more inside Paradise Peak! The first thing you’ll notice—and love—about Paradise Peak’s living room is the flood of natural light spilling in from multiple panes of oversized windows! 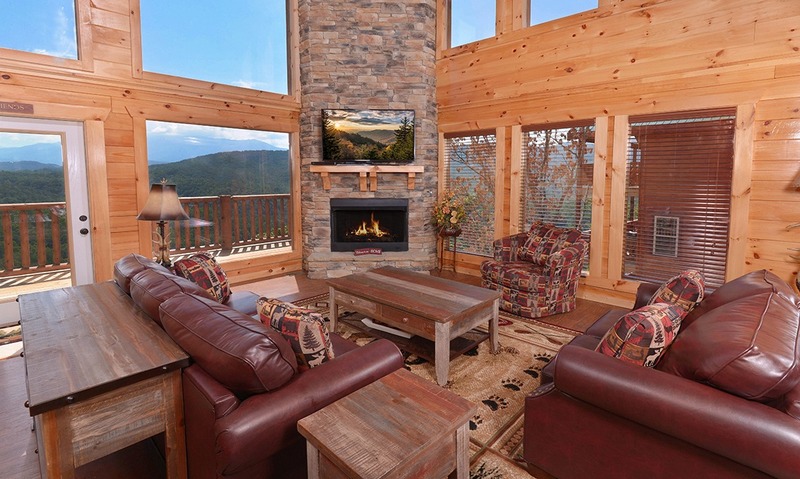 Enjoy views of the Smoky Mountains in the distance and soak in Smoky Mountain sunlight right from this room’s comfy couches—one full-sized and one matching loveseat. There’s also a coordinating chair that’s perfect for lounging with a book or kicking back to watch the game on the flatscreen. This big screen TV is mounted above another impressive feature in the living room—the gas fireplace, which is surrounded by beautiful stonework that reaches all the way to the top story of the cabin. Plan for relaxing afternoons with your group inside Paradise Peak’s living room. 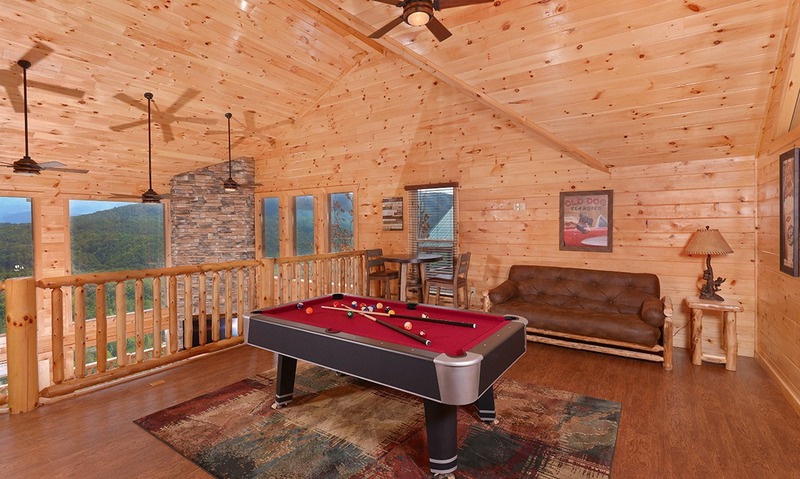 You can play a family game on the coffee table or use it to display a yummy selection of homemade goodies. But your favorite thing to do will probably be pretty simple: just sitting back and taking in the gorgeous scenery this room has to offer. Don’t think for a minute that mountain living means missing out on modern comforts and style. 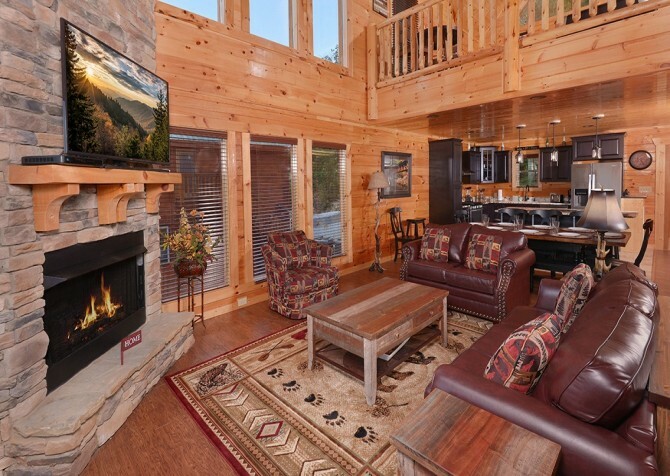 Paradise Peak has everything you’d expect from an up-to-date rental, including a sleek, well-designed kitchen. 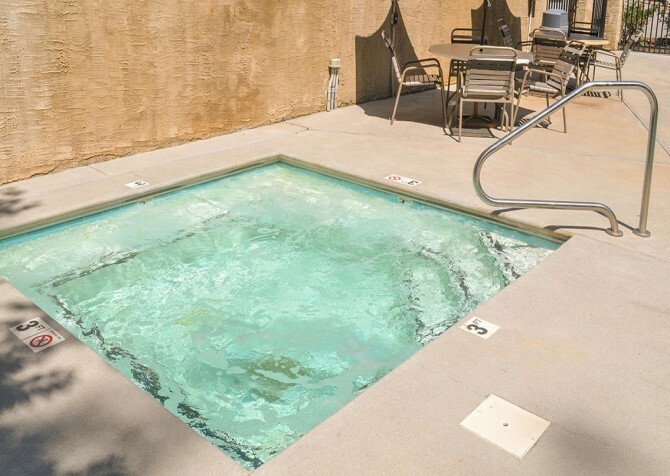 Enjoy stainless steel appliances, a travertine tile floor, and beautiful granite countertops inside Paradise Peak. 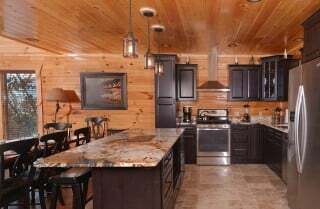 This L-shaped kitchen also offers convenient features like a coffeemaker, blender, tea kettle, and large island that doubles as a 3-person breakfast bar. 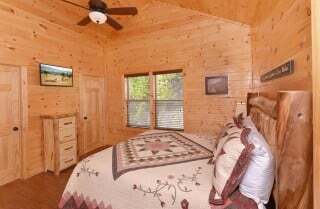 For those planning a special holiday meal or a private party with friends, Paradise Peak makes cooking in the cabin easy. But even if you aren’t planning anything special, you’ll still appreciate the convenient features of Paradise Peak’s fully equipped kitchen. Paradise Peak provides several options for dining in the cabin, beginning with the stylish black-and-tan dining table. 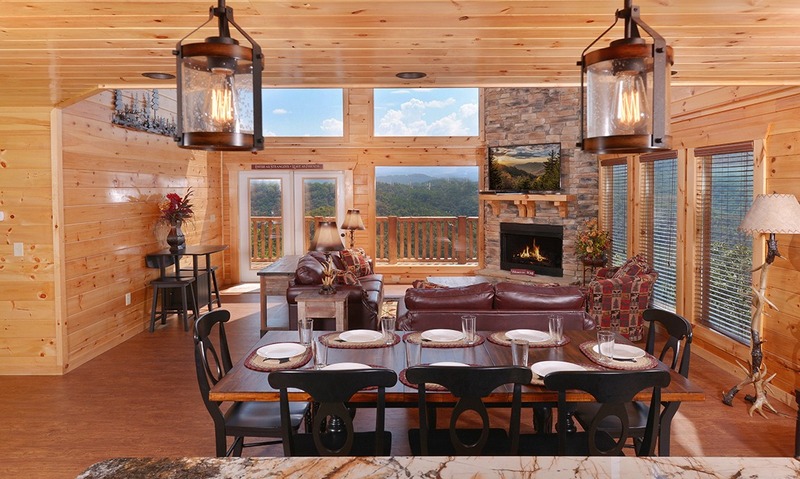 This 8-piece dining set is positioned right next to the kitchen’s 3-piece breakfast bar, so you’ll extra dining space here. And don’t forget that this cabin’s dining room is not only functional for eating in, but also for game nights and craft time in the cabin. 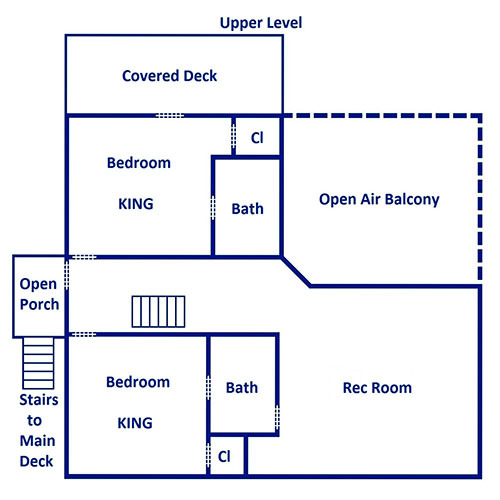 Or simply use the table to display your trays of appetizers and/or family-style spread. 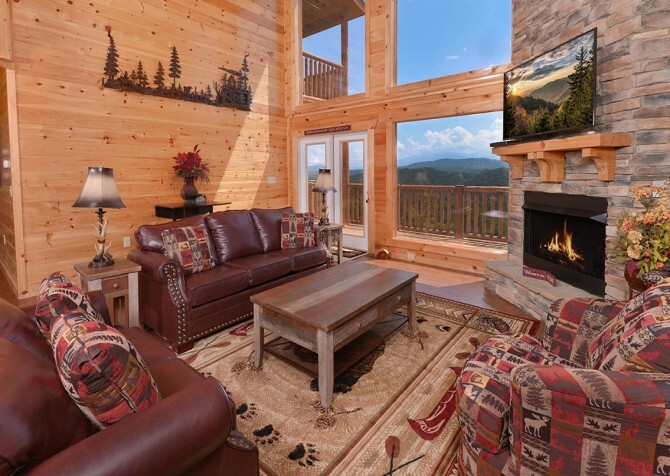 Other seating options include spreading out to the living room, which won’t limit the flow of conversation thanks to Paradise Peak’s open-concept floorplan. 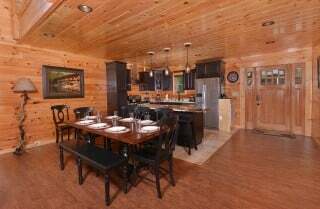 And don’t forget that this cabin’s dining room is not only functional for eating in, but also for game nights and craft time in the cabin. 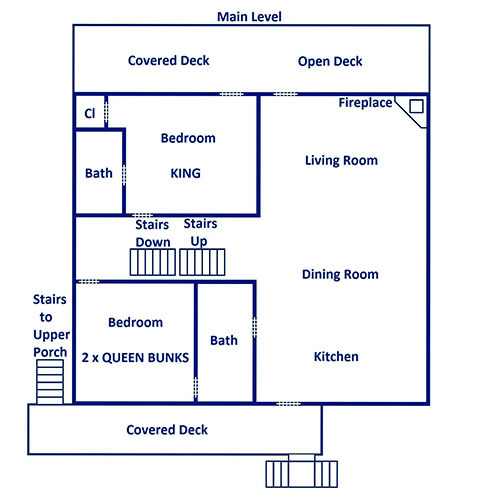 Or simply use the table to display your trays of appetizers and/or family-style spread. 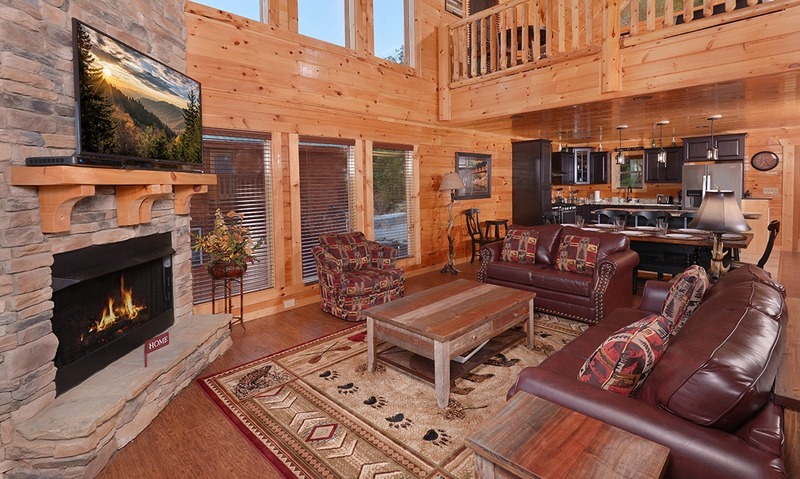 Besides the comfy living room and dining room for in-cabin meals, Paradise Peak features other great shared spaces to hang out. This cabin has plenty of fun and functional spaces to spread out, including the upstairs loft. 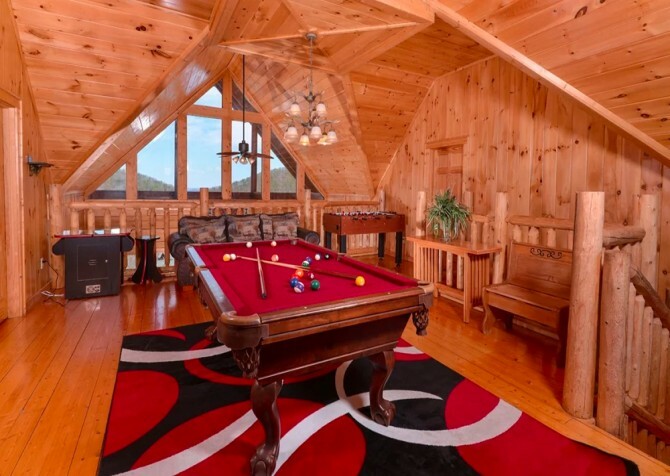 In this cabin, the loft doubles as a game room with a large pool table and a bistro-style table for cards, board games, chess, or checkers. So be sure to pack your favorite games before you leave, and plan to make the most of your Pigeon Forge stay at Paradise Peak. Another fun space inside this cabin is its fully enclosed, carpeted, and spacious private theater! 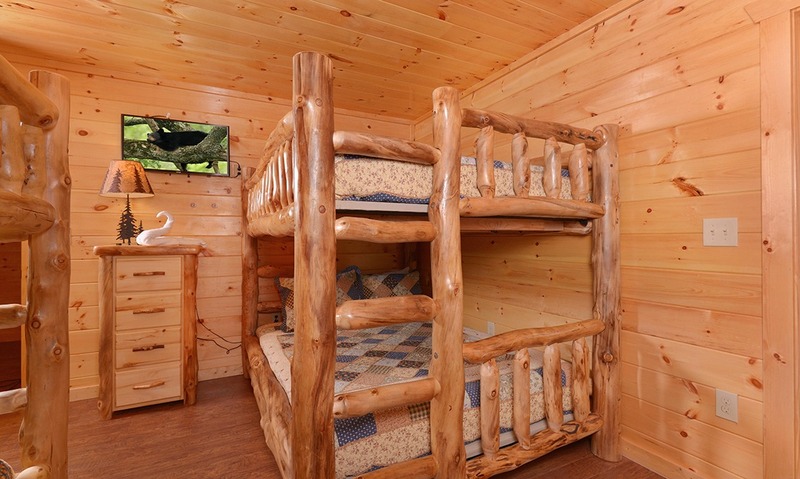 You can sit in one of the fold-down, theater-style chairs (with individual cup holders) or have a slumber party with blankets and sleeping bags on the floor during your stay at Paradise Peak. 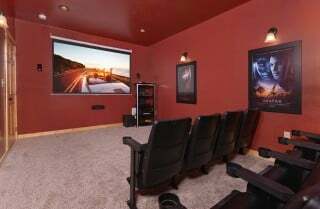 The 100-inch projection movie screen, surround sound system, and movie posters on the wall will all make you feel like you’re actually at the movies. 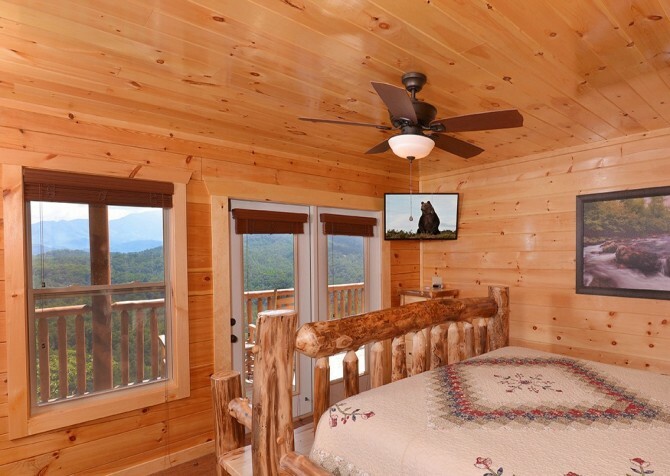 So don’t forget your favorite DVDs and Blu-ray discs—or stop by the nearest Redbox—and look forward to movie night at this fun-filled Pigeon Forge cabin. With a game room and private theater, you might be wondering how this more-than-4,000- square-foot cabin could get any better…well add to the list Paradise Peak’s heated private indoor pool! 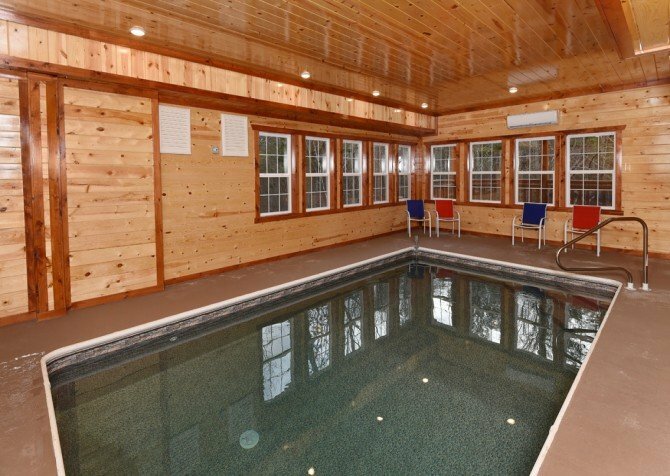 Framed on two sides by large windows and fully enclosed, this pool is the perfect amenity for a dreary day in the fall or winter or a summer day when you want a break from the heat. Swim beneath the waterfall feature, and at night, enjoy the multicolor LED light show in the water. 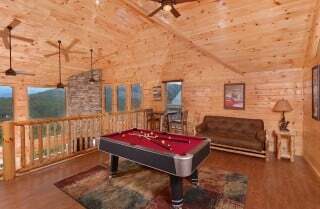 Your group will love hanging out in the pool room any time of year, but if you are planning a trip in the late spring or summer, don’t forget that this cabin—as part of the Sherwood Forest community—also provides access to an outdoor community pool. 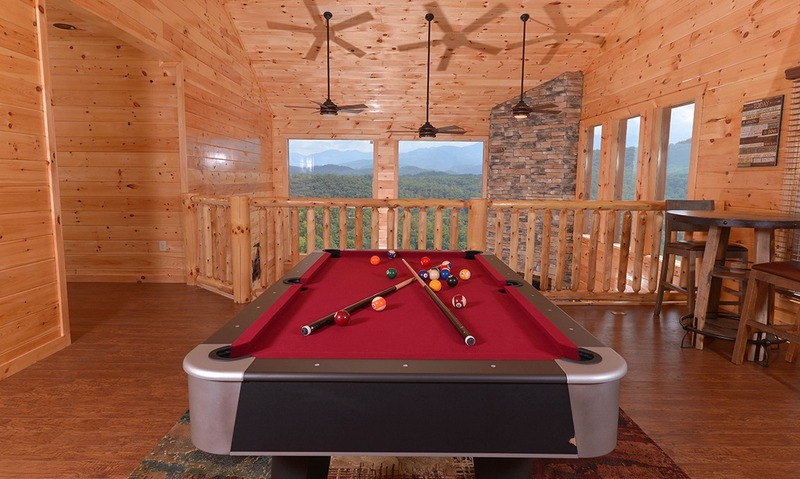 The options for fun are endless at Paradise Peak! Paradise Peak offers 5 bedrooms and 5 ½ bathrooms total, for comfortable accommodations for up to 20 guests. Four of the 5 bedrooms offer the same general layout: classic Smoky Mountain furnishings with king-size beds and a Samsung Smart TV. 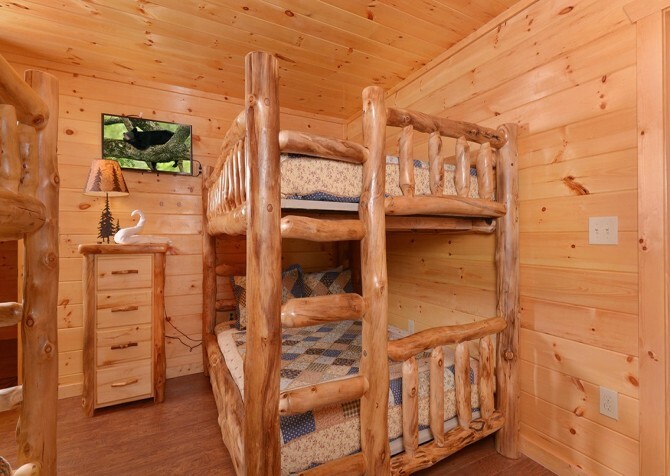 The fifth bedroom is a great option for kids with its 2 queen-size bunks and, again, a Samsung Smart TV. 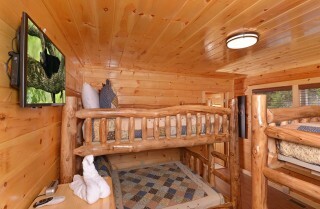 Paradise Peak also offers a futon and sleeper for your convenience. 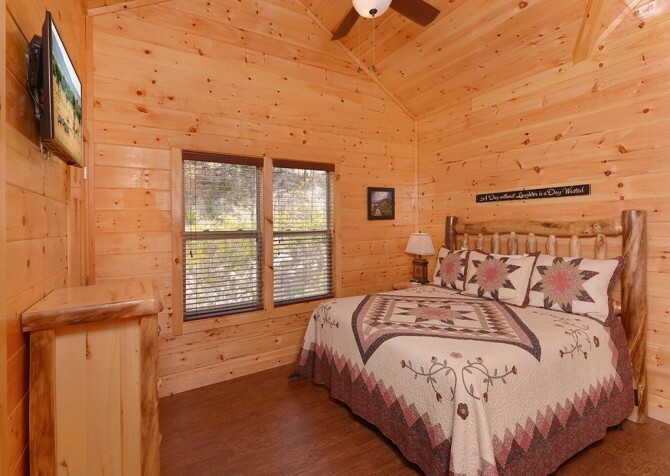 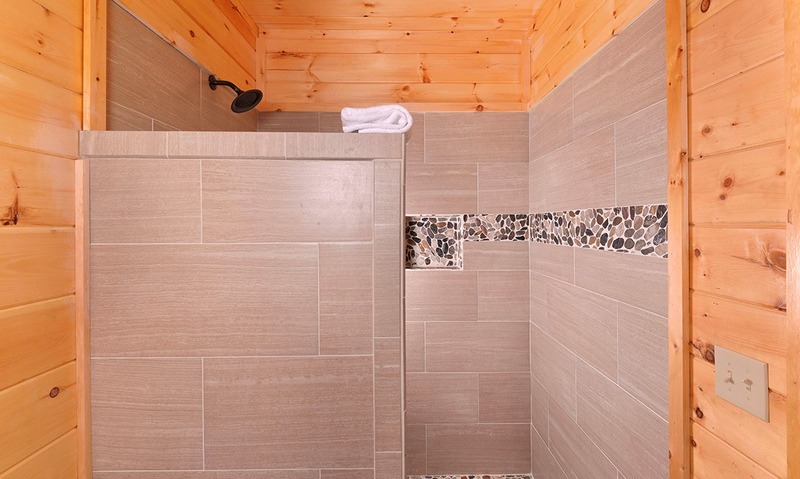 Along with these 5 bedrooms, you’ll find 5 ½ bathrooms inside this cabin—3 of which offer gorgeous walk-in showers with modern, decorative tile work. We can’t say enough about the gorgeous outdoor spaces offered by Paradise Peak. 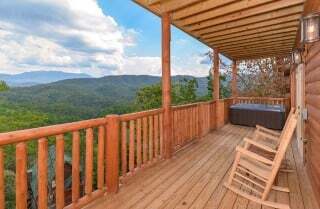 If you want stellar views of Mount LeConte and the Smoky Mountains in general, this Pigeon Forge cabin is definitely the right pick. You can enjoy these views from 3 deck levels provided by Paradise Peak, and on each, you’ll find rocking chairs for the perfect way to unwind after zipping around The Track or exploring the many other family-friendly attractions in nearby Pigeon Forge. 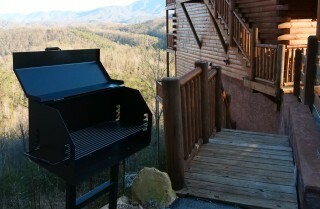 Also, take advantage of this cabin’s outdoor hot tub and picnic-style charcoal grill! 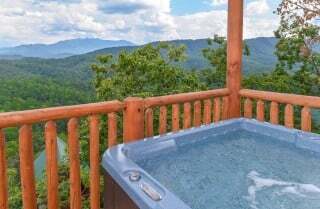 Plan for a relaxing soak beneath the stars or a Fourth of July barbecue with the family at Paradise Peak. 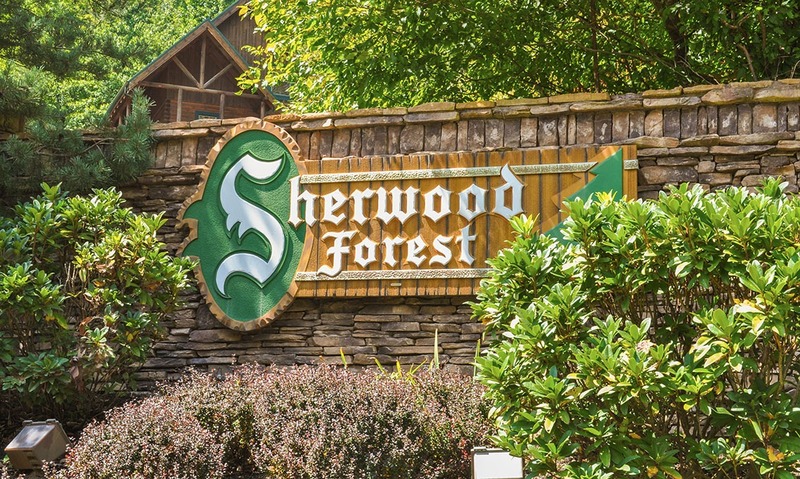 Remember, Paradise Peak is located within the Sherwood Forest, which is a gated community that provides pool access to all its guests. 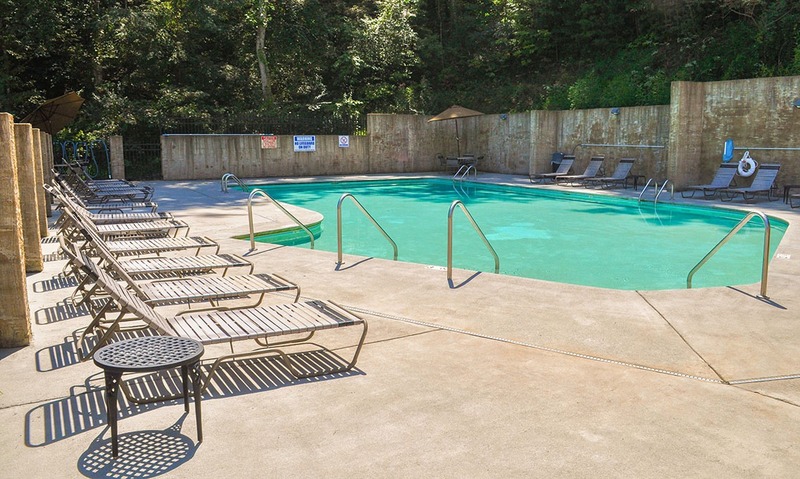 So if you’re wanting to lay out or let the kids play outdoors, head down the road to the community pool during your stay. Other amenities provided by Paradise Peak include a flat, paved driveway and parking area with space for 4 vehicles; access to a washer/steam dryer; and access to high speed wireless internet. 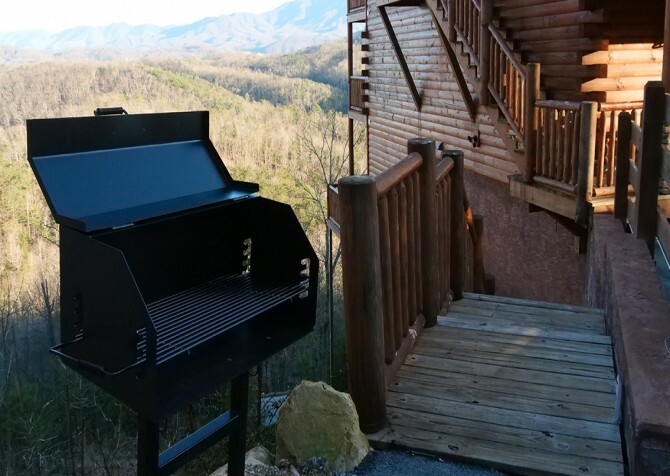 This last amenity will especially be handy when planning your Pigeon Forge itinerary. And to make things easy for you, we’re constantly posting the latest information about upcoming events and popular group attractions on our Cabins for YOU blog. 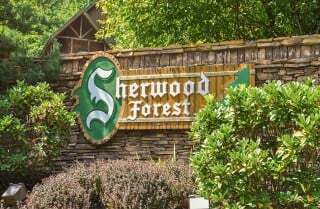 Come see the area’s largest musical variety show—with music from the Big Band era to today, aerial dancers, and impressive special effects—at the Smoky Mountain Opry. 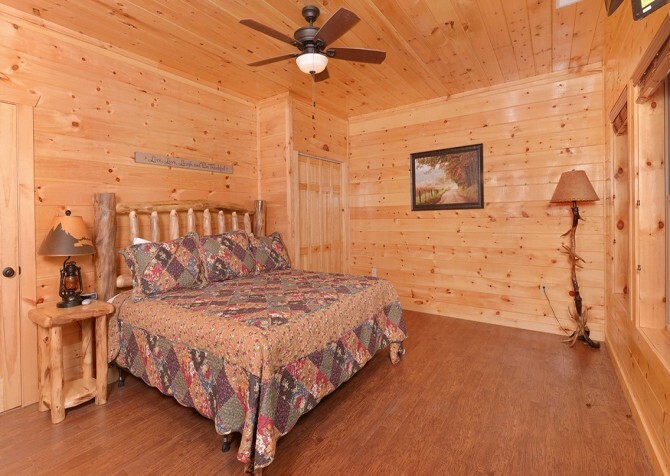 Dolly Parton’s famous theme park, Dollywood has been thrilling Pigeon Forge guests since it first opened in 1986. Come for the coasters, country music, comfort food, and more! 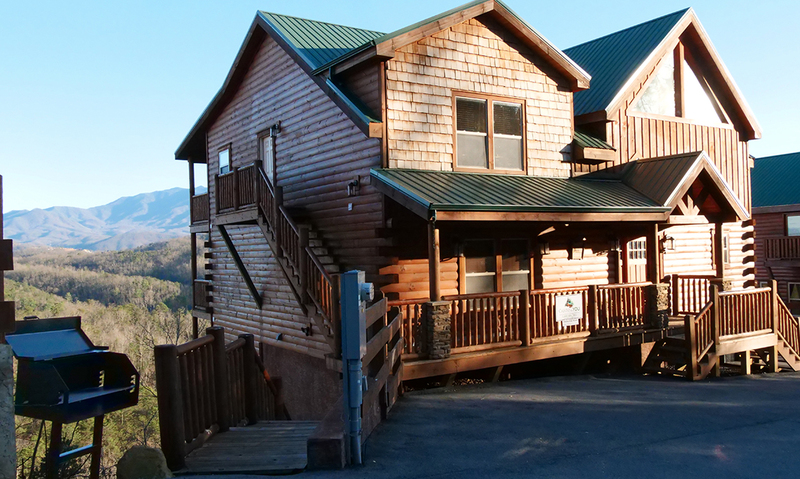 A Pigeon Forge landmark, the historic Old Mill was built in the early 1800s and has become one of the most photographed mills in the country. 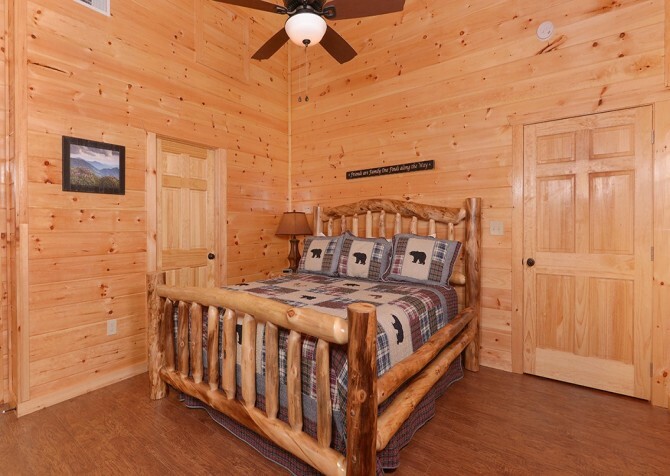 Come snap a photo of your own during your stay! "Great place to stay, close to everything. 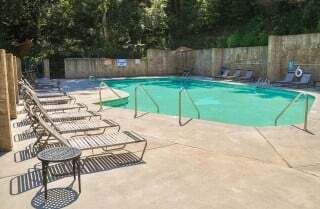 We had eight adults, seven teens, and a ten-year-old., Everyone had plenty of room, the kids used the pool & hot tub every night. Great family vacation!! 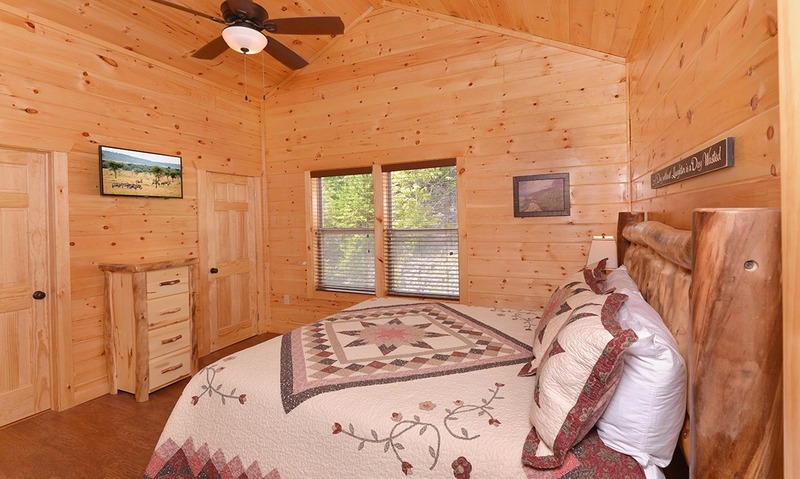 The rooms ( all couples had private space) and views were…"
"Great place to stay, close to everything. We had eight adults, seven teens, and a ten-year-old., Everyone had plenty of room, the kids used the pool & hot tub every night. 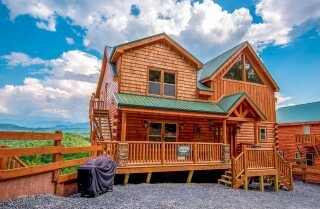 Great family vacation!! 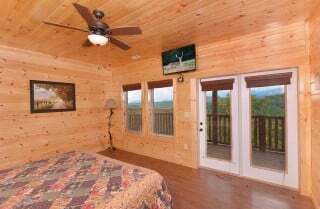 The rooms ( all couples had private space) and views were amazing. I can't say enough good things about this cabin." 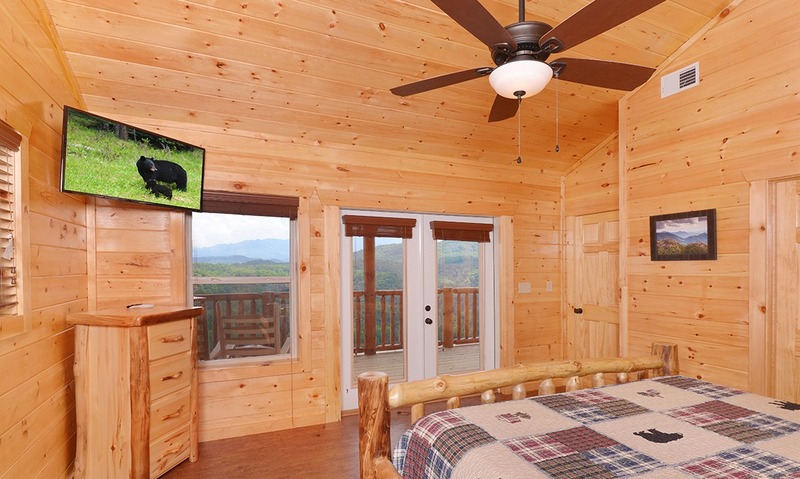 Thank you so much for this raving review of Paradise Peak! We are delighted to hear that your entire group enjoyed their vacation at The Great Smoky Mountains, and we look forward to serving you again in the future! 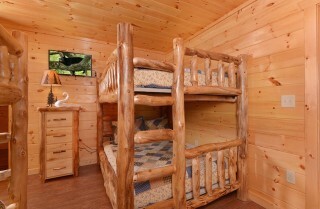 "This cabin is AMAZING, especially for large groups. 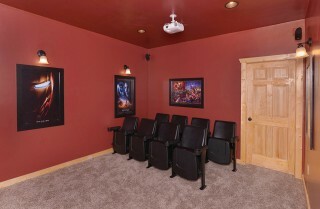 It is set up in a way that allows everyone to have space and not feel too crowded. The bedrooms and bathrooms are very nice and we loved the pool and the hot tub. 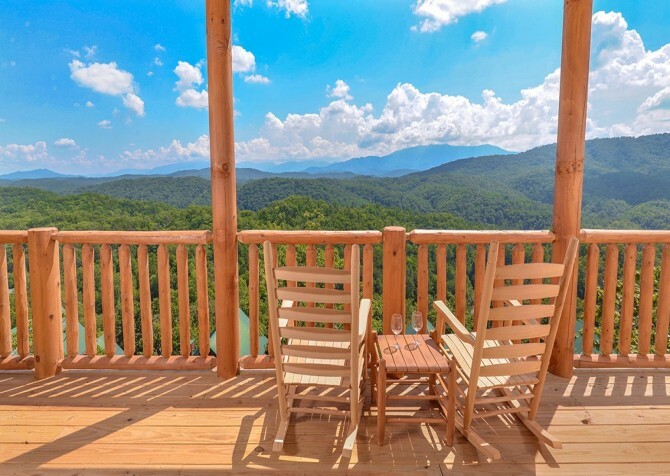 The views were amazing from the back porch." "We just got back from fall break. 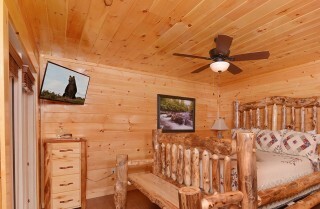 We stayed in Sherwood Forest and the cabin was Paradise Peak. 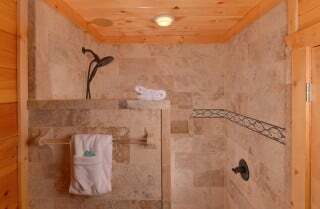 It was beautiful and just as promised. 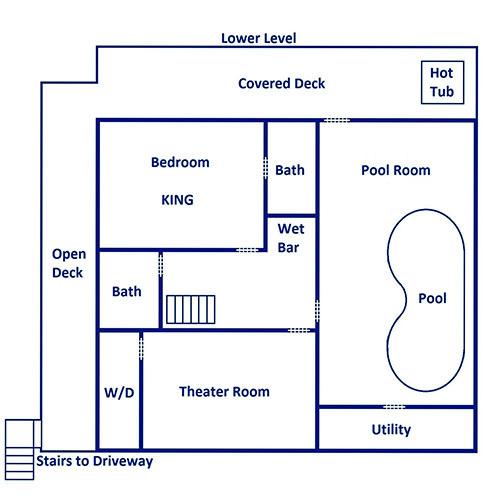 The lay out was great, all the space and bedrooms. 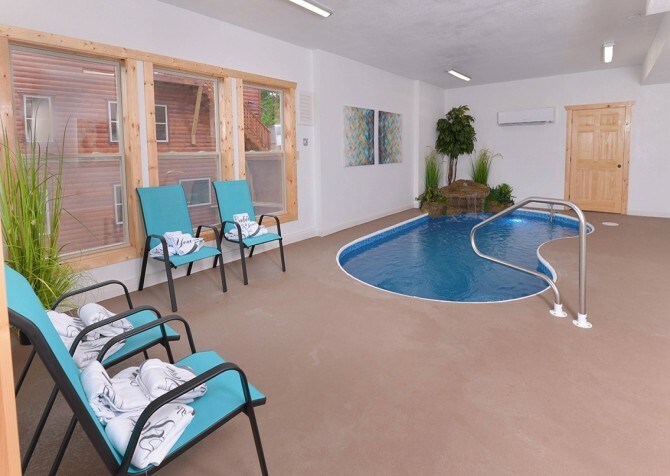 The kids loved the indoor pool and theatre room. 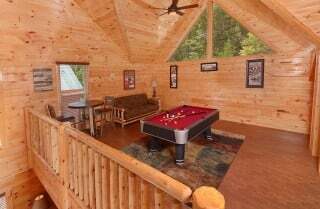 I highly recommend cabins for you!! 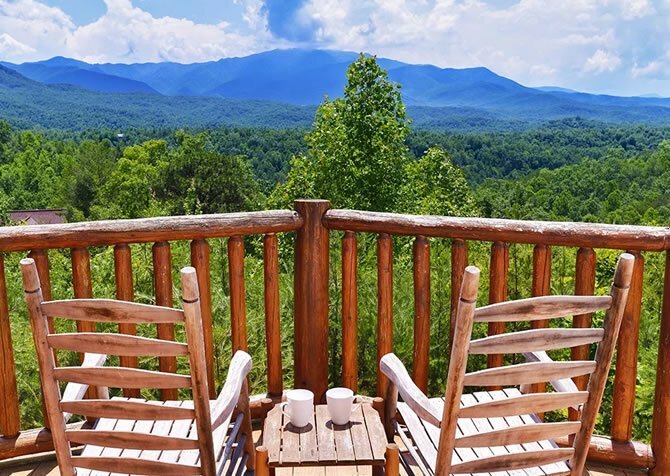 Being on the mountain was a beautiful scenery to wake up to! Thank you for making our stay so wonderful!!"